I have been re-visiting a lot of books recently and one of my favorites that appears in the Mental Fitness Challenge is called Rascal by LIFE founder Chris Brady. Orrin Woodward and Chris Brady are both best selling authors, sought after speakers and leadership experts that have an incredible gift of teaching through humor. While I would encourage everyone to either purchase the book or go back into their library and re-read the book, I understand that many won’t right away so I will take captions directly from Chris’s book to explain the process he describes (all quotations and italic sentences in red below are cited directly from the Rascal book by Chris Brady). To stay as neutral as possible I will take this process and the information from Brady’s book by using the example of someone wanting to lose weight; but keep in mind that this process follows the same suit in any Rascal’s life so feel free to replace weight loss with any category you wish. The person in the zone who’s goal is to lose weight makes no excuses for missing workouts. They have the discipline to eat healthy and not ‘give in’ to cravings or temptations. “Being in the zone is one of life’s most rewarding, fulfilling, memorable moments. It’s a natural euphoria… the zone is where Rascals live. They love it there.” As Brady says, many people have never experienced being ‘in the zone,’ only Rascals do. But everyone is invited and encouraged to find their way there. As you can see Obstacles can be very intimidating for a Rascal who doesn’t know how to properly destroy him and “Obstacles succeeds in coaxing a Rascal out of the zone. It could be any of his weapons to do the trick, from fear of distraction to low self-confidence to a failure in character, relationship challenges or any of the others. Where once the Rascal was overcoming fears and learning and doing with excitement and enthusiasm, now the Rascal caves in to fears and falls into inaction.” The person wanting to lose weight all of the sudden allows Obstacles to distract them from their initial goal where they become inconsistent in their habits and their thinking. They stop weighing themselves on a regular basis, avoid exercising regularly and give in to temptation more easily. “The less action he puts forth the more his mind intellectualizes, becoming some elite thinker and never accomplishes anything… This leads to paralysis as fear sets in even further. Paralysis then leads to frustration. The Rascal starts looking at his or her lack of results.” Because the Rascal is no longer following their initial game plan of consistent exercise and healthy eating, a negative result becomes obvious and they become frustrated with themselves for not sticking to the plan. Many times while on the weight loss journey, one finds themselves losing strength and control – the holidays are coming, winter is near, an injury takes place, etc and that’s where the Rascal is challenged and encouraged to overcome Obstacles and take the other side of the fork in the road. “At this moment we see the courage of the Rascal tested to the limit…they remember why they started out in the first place and refresh those dreams and causes in their minds until they reconnect with them emotionally… Having made the choice not to wimpify, a Rascal seeks the association of other Rascals within whose company he can be strengthened and rebuilt.” This refreshing of the dream leads the Rascal back to their original goal or dream where they are given a new chance at entering back into the zone where they live and hunger for. I love this Productive Loop that Chris Brady created because it is so true of everything a Rascal goes through in life. 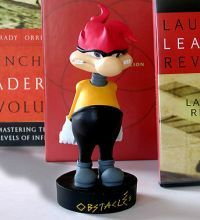 If you don’t understand what I mean by a ‘Rascal’ then I highly encourage you to read Brady’s book – it is incredible. As Orrin Woodward states in the Foreword, “I have named Chris Honorary First Rascal” but I know Chris is not the only Rascal out there. In fact, I know of a large community of people who associate with the LIFE business who are all rascals in their own right because they have the ‘courage to pursue their own dreams.’ Are you a Rascal? Please comment below! I know a lot of Rascals out there who have gone through this productive loop (of being in the zone) in not only the-life-business but other areas of their life and we would love to hear your stories! Are you the type of Rascal that Chris Brady would be proud of? Can’t wait to read your feedback! Looking for your favorite post?